The Migratory Bird Hunting Stamp Act, which went into effect seventy-nine years ago on July 1, 1934, authorized the annual issuance of what is popularly known as the Duck Stamp. In 1976, Congress changed the official name to the Migratory Bird Hunting and Conservation Stamp, presumably to broaden its appeal to non-hunters. Over the following thirty-seven years there has never been a concerted effort to promote what is still called the “Duck Stamp” by the United States Fish and Wildlife Service (USFWS) to anyone other than hunters and philatelists. All you need to do to realize this unfortunate reality is to check out their official “Duck Stamp” page announcing the new 2013 – 2014 season. You don’t have to be a genius to see the folly in this approach to Duck Stamp sales. Why promote the stamp to waterfowl hunters when it is mandatory that they buy one to hunt waterfowl? Philatelists, after seventy-nine years, are already tuned in to the advantages they enjoy from collecting the stamps. It is only the growing number of birders, photographers and conservationists that need convincing. Does anything in these figures jump out at you? Like three times the number of photographer visits as hunting visits, four times the number of auto tour visits, and a whopping twelve times more wildlife viewing visits than hunting visits! Clearly these staggering figures on usage of our National Refuge System would lead most rational people to consider a strategy to enhance the experience of those members of the public visiting the refuges the most right? Maybe even come up with a strategy to help this multitude of wildlife viewers contribute monetarily to the refuge system they seem to enjoy so much? Instead, the new Draft Hunting and Fishing Strategic Plan only speaks to increasing quality hunting and fishing opportunities on refuges. The fact that the USFWS doesn’t even see the potential of tapping into this huge contingent of non-consumptive wildlife viewers is mind boggling! Instead they would rather concentrate on increasing the number of hunters and fishers because they are required to make purchases (including the Duck Stamp) to pursue their sporting activities. We non-consumptive users of our National Wildlife Refuge System want a Wildlife Conservation Stamp that reflects our priorities for our National Wildlife Refuges! We believe that those 30 million wildlife viewing visits should be the focus of Wildlife Refuges and the Next Generation. Please take a few minutes to read the Draft Hunting and Fishing Strategic Plan then share your comments on this plan. The public comment period is open until August 15th so do it now. We believe that the Duck Stamp and the Wildlife Conservation Stamp can exist side by side to supply a much larger and much needed income stream for our National Wildlife Refuges. If you haven’t read our proposal or seen the benefits of the Wildlife Conservation Stamp, please visit the website and support us by liking us on Facebook. Nothing stated here should be construed as opposition to hunting and fishing, I just think that the USFWS is missing the boat here. There is a huge untapped source of income for the refuge system that is being ignored and we have a simple solution. Create a Federal Wildlife Conservation Stamp! Perfectly stated, Larry — and why I’m 100 percent committed to a new Wildlife Conservation Stamp for birders and photographers. Although Refuge funding is the most critical facet of the new stamp, equally important is the fresh framework we are proposing, wherein non-consumptive users have their own dedicated program through which to show support for Refuge wildlife, and also expand upon innovative ideas for birders and wildlife observers on Refuges. I was slack-jawed when I read those figures in the report, showing the grand disparity in visitor numbers — followed by the lop-sided recommendations. It’s difficult to believe the current plan even takes into account those figures … at all. Thank you Ingrid. I agree. I don’t see how they could create a strategic plan without including wildlife observers. I too am 100% committed to a new Wildlife Conservation Stamp that would count me as a non-consumptive user of the National Wildlife Refuge. To completely leave out birders, wildlife watchers and nature photographers in the new Draft Hunting and Fishing Strategic Plan is akin to being slapped in the face. With the facts and figures we have on how many visitors there are to the refuges who are non-consumptive users I find it extremely difficult to believe that we weren’t taken into account. I want to show my support as a non-consumptive user and if I buy a Duck Stamp it appears that I am an extractive user and that is why I don’t and won’t buy the Duck Stamps. I understand your concern Mia because we have gotten many comments echoing those same concerns. Non-extractive users of the refuge system don’t want to be counted as extractive users thereby giving them more political clout than they have earned. They want to be counted as birders, photographers, kayakers, hikers, wildlife viewers or whatever other non-extractive user category they may choose to show their support for the refuge system. I actually also wouldn’t purchase this stamp, either. Not a single spot I go birding in on a regular basis is a National Wildlife Refuge, and the last time I went to an NWR, I was treated like garbage by the employees. As somebody who doesn’t hunt, if I had a choice between the two, I’d probably just buy the Duck Stamp instead. I can respect one’s anti-hunting perspective. I never have hunted nor could I see myself hunting but I do know some incredibly ethical and responsible hunters who hold a deeper respect for wildlife/nature than anyone else I know – including birders. The whole “Duck Stamp” controversy seems a bit hypocritical to me. I have cherished birding memories at places like Forsythe NWR, Supawna Meadows NWR, Parker River NWR, Laguna Atascosa NWR, and Santa Ana NWR. On virtually EVERY trip to these places, I’ve seen other birders there as well. The recent Rufous-necked Wood-rail has recently beckoned legions of birders to Bosque Del Apache NWR. 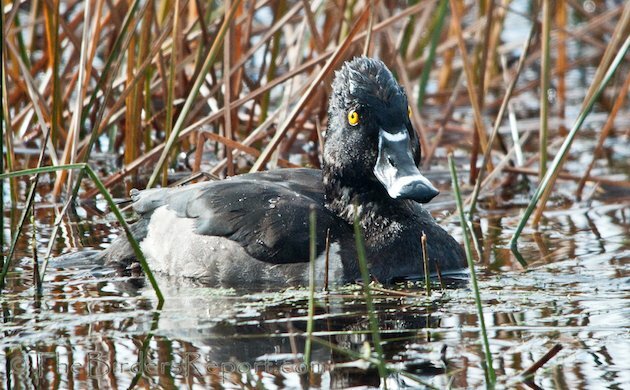 If birders are so against the Duck Stamp, why do they continue to visit refuges that were between 75% – 100% funded by the Duck Stamp? If one is really so disgusted by hunting and the Duck Stamp’s connection to hunting, then how can they so easily savor the bounty of the Stamp? For birders that stand strong against the Duck Stamp, I would completely respect your conviction IF I didn’t repeatedly see you at NWRs around the country. Otherwise, it seems like more talk than actual conviction. If birders stopped going to NWRs, what would that prove? The idea is to make ourselves known, seek out ways to support the refuge system in ways that make sure to highlight the impact of birders, and urge park managers to take birder access and management interest into consideration when making decisions. We have a group of people that *want* to be able to support the refuges in ways that make it clear their interests are considered. How is that wrong? Dave, you seem to be missing an important facet of Larry’s piece which is that non-consumptive users want and *do* support National Wildlife Refuges. Even those who don’t purchase the Duck Stamp pay entrance fees at those Refuges that charge visitors. Some birders volunteer on Refuges or as part of Refuge Friends groups. You probably know that the Migratory Bird Conservation Fund revenues (which include Duck Stamp revenue) have purchased approximately 3 percent of Refuge lands (source: USFWS). Other expenses, acquisitions and so forth have come through Congressional appropriations and public monies. So, the bottom line is that there is no hypocrisy involved. We all support our National Wildlife Refuges. What we are proposing is a new way to channel the contributions of birders and photographers who have deep passion for conservation. Refuges would benefit greatly from a new stamp that provides more revenue in a time of declining options — potentially, a very large amount of revenue when you consider the overall economic contribution of wildlife watchers. A separate stamp would revitalize the support of this demographic for various reasons, not the least of which is that it would provide an accurate measure of non-consumptive users and their priorities, something clearly neglected in proposals like the strategic plan discussed here by Larry. Did you read the plan? And if you did, as a birder who supports Refuges consistently, are you genuinely satisfied with those provisions? I also know very ethical and responsible hunters Dave, and respect them very much. As I stated at the end of the post, I am not anti hunting. We are simply trying to develop a new source of income for the refuge system which would include millions of non-extractive users of the refuge system that currently don’t buy the Duck Stamp for countless reasons. This would be a PARALLEL SOURCE OF REVENUE to fund the refuges that we all love! I currently buy an annual pass for my local National Wildlife Refuge Complex as well as paying $15 per day to reserve a photography blind which is won through a lottery process. By the way, these NWRs listed on the USFWS source you link to are have actually been funded by the Migratory Bird Conservation Fund (MBCF) which is partially funded by the Duck Stamp. Each year, Duck Stamp revenues are deposited into the Migratory Bird Conservation Fund (MBCF) along with appropriations from the Wetlands Loan Act of 1961, import duties from arms and ammunitions, receipts from refuge admission fees, refuge rights-of-way, and Federal Aid funds. The total of all these contributions (as shown on your link) fund about 8.4% (purchased and easements) of the 95 million acres in the National Wildlife Refuge System. To me, buying a Duck Stamp is the same as me going to a NWR and birding, but if anyone asks I tell them that I am hunting. Why would I do that? I feel like I am mis-representing why I am spending time there and what my motives are. And the draft strategic plan seems to completely validate view for me. I want to be able to stand up and say, “I count as a birder and I contribute” but I don’t feel that with the Duck Stamp. Thank you for your perspective on this issue Drew. We have heard the same response from many of our readers. We want to support the refuge system even more than we already do, if only we had an avenue to do so. We believe the Wildlife Conservation Stamp is that pathway to fulfillment. You sound like you may want to be included on our “About Us” page Drew. Although I have not visited a lot of NWRs I have been treated well by all that I have. I am not a hunter but a photogrpaher and birder and generally like wildlife and nature. If a birder or photogrpher visits a NWR 3 times then they have paid the cost of the duck stamp and if they conitnue to visit then they actually pay more so financially it might be better to just have them pay. However having a large number of duck stamp or conservation stamp holders might be better with influence. Sometimes remembering why something exists should be taken into consideration as well as its change in useage over time. You might create a lot of interest if you hae a birding stamp, and a photogaphy stamp where people could submit bird drawing other than ducks and photographs other than ducks for those stamps. There might be a lot of each that would be interested in competing for the possibility of having one of those stamps. A conservation stamp could be of landscapes or other animals. You mihgt even find hunters that might like a different rendition on occasion as I bet most like nature as much as photographers, conservationists and birders. You bring up some good points Tom, many of which the Wildlife Conservation Stamp is proposing. Take a look at our Benefits of the Stamp page. I must say I have visited many NWRs and have been treated with respect and appreciation at each and every one of them. People need to realize that most of the staff you will meet at a National Wildlife Refuge are volunteers. That’s right, there are close to 42,000 volunteers contributing in excess of 1.5 million hours to our refuges every year, all across the country. Most of the staff I have spoken with are very excited about the Wildlife Conservation Stamp and say they would support it wholeheartedly! In a world that needs unification, increasingly regions wish to be recognized as unique countries. Over fiver years ago, I began to include a short paragraph or two about a birders stamp in my public speaking. IWhen the NWR or other conservation agencies have stakeholder meetings to discuss current issues where the public has a chance to comment in person who shows up? Through my job I have attended many of these meeting and I can tell you that birders do not. 99% of the people who show up are hunters or anglers or ATV riders or something else. I almost never hear from or see a birder or photographer. So you ask why the USFWS is gearing their future plans towards those that take the time to show up and express their opinions and needs. It’s a no brainer. Get organized birders. We could have a very loud voice if we did. Mike, in short, that’s one of the benefits a Wildlife Conservation Stamp would confer … a very identifiable way to show support to our Refuges as birders, as photographers, as wildlife watchers. You bring up a very good point Mike. How would birders, photographers and other conservation minded folks find out about these stakeholder meetings? I have never seen an announcement for one of these meetings on a NWR website or the USFWS website. Perhaps because you work in the field you are privy to this information? Please help us out here. I would think friends of the refuge groups would attend these meetings as a matter of course and birding organizations would send representatives as well if we knew about them. Birder forever; never hunted in my life. But isn’t this idea dividing us, rather than uniting us, as someone said earlier? It’s not a contest, is it? Aren’t we all after the same thing? conservation of habitat for birds and other wildlife? So doesn’t this duplication of resources — the bureaucracy created to implement and maintain another stamp system — seem like a needless waste of money, just so we can say “I’m not with *them* (those hunters/extractors)? Ducks Unltd has protected a lot of habitat, protecting “our” birds. Can’t we all just get along? We don’t want this to be a contest Margaret, we want it to be a parallel income stream along side the Duck Stamp to raise even more money for our refuge system. We feel that this will unite another huge sector of the conservation community who, with a Wildlife Conservation Stamp that they can be proud to buy and display, will join Duck Stamp advocates in the satisfaction that we are all being recognized for our contributions to wildlife habitat and conservation. If you read our proposal and benefits of the stamp pages, you will realize that this is not a duplication of resources. There are differences in the Wildlife Conservation Stamp that would contribute to wildlife habitat other than wetlands and species other than waterfowl and game species. As far as the cost of creating the stamp and promoting it, those costs would be covered by the income created by the stamp itself, just as the Duck Stamp is. We can all get along! Especially if non-extractive users have a stamp that we can feel represents our interests. This is a great debate, and I’m thrilled that it’s taking place. But as the author of “The Wild Duck Chase,” a new book about the federal duck stamp program, I’d like to challenge the notion that birders are “non-consumptive.” As USFWS Director Dan Ashe argues in the book, don’t birders use the roads, bridges and trails in the National Wildlife Refuge System, much of which was assembled with Duck Stamp money? Does their presence not require staffing and maintenance? I’m not a hunter, but how can the people who most enjoy our wild places deny the incredible contributions of hunters since 1934 to preserving the resource they enjoy? I’d suggest that the goals of the Federal Duck Stamp Program are precisely aligned with those of the birding community — to preserve habitat for waterfowl — and that any effort to create an alternate stamp will only dilute the effectiveness of that singular mission. Martin, thank you for writing a fascinating book. I bought it and read it when it was first released, and appreciated the colorful narrative, history, and the unique facets of the competition. I realize that “consumptive” can be a contentious term with some. We’re obviously referring to the common usage which suggests activities that remove natural resources, which is why I prefer “extractive” — although that term, too, is not perfect for the purposes you suggest. Perhaps we can agree on the idea that all humans consume resources … and then make a distinction between those ‘recreational’ activities that have, at their core, an extractive purpose versus an observational one. I don’t think anyone can argue that hunting birds and observing birds have the exact same impact on shared public lands. If that were the case, Refuges wouldn’t employ trail and habitat closures to separate the two. That’s not a statement for or against one or the other. It’s merely to suggest that noting the difference is warranted. In our various posts, we do not deny nor denigrate the contribution hunters have made to conservation through these mandated fees and taxes. We’re merely stating that hunters contribute a portion, while non-hunters and taxpayers also contribute significantly to wildlife and habitat conservation, including Refuge conservation. In your book, you quote the editor of WildBird magazine who regularly makes attempts to bridge the understanding between birders, hunters and the Duck Stamp. But even she says she’s not optimistic that the cultural bias can be overcome enough to convince birders to buy the stamp in quantity. I personally don’t think the cultural bias and objections should be diminished. People have strong feelings and valid concerns about these issues — and to suggest they shouldn’t feel that way doesn’t seem like a productive way to engender the much needed support. There are reasons why non-hunting users develop those associations — they’re not all misguided or pulled from thin air. There are some recent examples on Refuges, Loxahatchee, for example, where a majority of Refuge users spoke out against proposed wildlife policies, but were told that despite the public objections, plans would proceed with an unpopular hunt. In these cases, birders often get blamed for creating division when they raise vocal counterpoints. But the division existed long before that if the Duck Stamp revenue is used, as it often is, to suggest that birders don’t pay their fair share (which is not entirely accurate to begin with). Part of the reason we support this project is because we all work in conservation in some form, and we have seen the passion, enthusiasm and commitment that we all have for our wild habitats, our Refuges and our wild animals. We want to promote Refuges in a positive, innovative and fresh way that encourages this new and growing demographic of wildlife watchers to be as invested as we are. The reason the hunters and fishermen were represented on the committee is that they’re the ones paying the tab for the rest of us. I’ve been buying a duck stamp for the past 10 years. But that says nothing for the first 20 years of my birding history when I didn’t. I know that if it weren’t for the taxes paid on shotgun shells and the money raised from duck stamp sales, we wouldn’t have half of the refuges we have now. Birders need to pony up and pay for the access they’ve long been getting for free. Duck stamps work, and we should all buy one every year. I’m afraid the old argument you put forward that hunters and fishermen are paying the tab for the rest of us just doesn’t hold water David. In case you haven’t read the figures from the USFWS, you can see them here. In the meantime, this is a quote from the USFWS website: “Although excise taxes on firearms and ammunition have provided over $2.5 billion to the states for wildlife and habitat management none of that money has been used to acquire lands for the National Wildlife Refuge System. The sale of Migratory Bird Hunting and Conservation Stamps (Duck Stamps) have brought in about $477 million since 1934. Approximately 10 percent of the Duck Stamp revenues come from non-hunters (stamp collectors, art dealers, hobbyists). Another $197 million has been added to the Migratory Bird Conservation Fund as an “advance loan” from the Treasury. Finally, about $153 million has been added to the MBCF from import duties on firearms and ammunition and from refuge entrance fees. All this set aside, why wouldn’t you want an alternative stamp that millions of people would purchase, that would contribute greatly to the NWR system’s income and benefit everyone as well? What is the downside to this proposal? Really, all the conservation/wildlife stamp needs is advertising. Birders would buy it if confronted with it, along with a good sales pitch, often enough. It’s not an expensive purchase. And since birders are compulsive collectors, perhaps signed stamps, and limited edition prints of them (as the duck stamps already have) would be a money-maker. Also don’t forget, the hunters HAVE to buy a duck stamp to get their hunting license. That’s bound to increase sales. Ingrid, funny you should mention Loxahatchee. They need to “repair” some areas for wildlife use. The machine necessary is available, non-functioning for lack of a part. Money is available to pave a short gravel road, but not to fix the machine. So goes the government. That’s exactly why refuges need the financial support of birders, and a wildlife stamp. While I am no marketing expert and do not know how creating a separate stamp would bring in more revenue, I do think there are a great number of birders, photographers, and other wildlife viewers who simply may not know what the proceeds of a duck stamp do. This past winter when I pulled over on a country road to photograph some Horned Larks, a car pulled up beside me and the driver asked if I was okay. I explained I was just taking some pictures of birds. It turns out this guy was an off-duty USFWS employee. When he found out I was a birder, he said, “I love birders!” Then after chatting for a bit about larks and joking how he thought we birders were crazy, he concluded our road-side conversation by telling me to buy a duck stamp. Having once been a duck hunter, I knew that proceeds from the duck stamp were used to acquire more land for habitat. But that fact didn’t dawn on me as benefiting me in my new hobby of birding until this chance conservation. Not having bought a duck stamp for years, I now make the annual “donation.” Besides being a monetary contribution, my son enjoys putting the stamps on the inside cover of his field guide. Not only do I purchase my own stamp, but I now encourage readers of my birding blog to also buy the duck stamp, especially when I write about birding on federal Waterfowl Production Areas. How many other nature enthusiasts and average citizens would also buy the stamp if we started promoting its benefits through our conversations in person and on the internet? We don’t need to wait on the government to enact a change in marketing in order to tap into this huge revenue stream. People don’t know what they don’t know. Josh, I don’t want to get repetitive in light of my multiple comments here. Larry and I, both involved with the Wildlife Conservation Stamp project, have outlined why we believe a birders’ stamp is a good idea and a potentially lucrative adjunct to the current system. We cite the various benefits at our website, some of which are particular to the conservation goals of birders and photographers. As I mentioned previously, we have hunters among our supporters who think this is a great idea — a fresh way to approach the funding gaps from multiple, innovative angles. And, we hear from readers, over and over, that they would enthusiastically and without reservation, support a stamp that not only promoted Refuges financially, but that also reflected their affiliation to conservation as birders, photographers and wildlife watchers. Even a seemingly small feature we propose — that the new stamp feature wildlife photography and various species beyond ducks and even birds — gets positive commentary for its inclusive nature — and for the fact that it will draw entrance-fee income from wildlife photographers, comparable to what artists do with the Duck Stamp. Lastly, there are existing models for the success of wildlife conservation stamps like the one we are proposing which address conservation concerns not generally covered under the auspices of protecting waterfowl habitat. That is not to diminish, at all, existing efforts. It is, again, a proposal to enhance and expand the potential of a very large and passionate demographic of conservationists who are interested in supporting an even broader set of wildlife priorities. The current Migratory Bird Hunting and Conservation Stamp (often called the Duck Stamp) isn’t perfect, but it’s securing very important wetland and grassland habitat AS WE WRITE. We also need to work TOGETHER in difficult times… and that means with waterfowl hunter-conservationists who have helped sustain this funding mechanism for decades. Anyhow, I just bought TWO stamps to “double up” along with the campaign promoted by waterfowl hunters. Here is the problem Vito and the reason we propose another Wildlife Conservation Stamp attractive to non-extractive users of our National Wildlife Refuge System. Other than a few stamp collectors and other non-consumptive users, ONLY WATERFOWL HUNTERS BUY THE DUCK STAMP!!! According to the U.S. Fish & Wildlife Service (USFWS) there are approximately 13.7 million hunters in the United States and nearly 71.8 million wildlife watchers. Of those 13.7 million hunters, only 2.6 million hunt migratory birds and only about 1.3 million hunt waterfowl. Over the last 15 years, the average number of Duck Stamps sold per year was around 1.5 million, contributing an average $25 million to wildlife refuge wetland habitat purchase and leasing each year. These figures show that less than 10 percent of all hunters buy the Duck Stamp and that would be the ones required to buy it to hunt waterfowl. Read my last blog post on the subject. Because of these facts, it seems obvious to me that a new Wildlife Conservation Stamp would certainly bring in more money to the NWR system than what is currently being realized from this tiny minority of the American population. I’m in favor of both stamps as well. It gives multiple users a sense of identity as to who they are and why they support the refuge system. In either case additional marketing and education efforts are important to raise revenue and consumer confidence that the proceeds of their purchase are supporting a cause they’re passionate about. The state of Ohio has done a nice job of providing a wetlands stamp required for waterfowl hunters and a wildlife legacy stamp for others who simply support the protection of wildlife habitat. It works for both crowds, and the ODNR collects funds from both demographics. Thank you for your thoughtful comment Adam! I agree 100% with your assessment of an alternative stamp for wildlife conservation. The Ohio Wildlife Legacy Stamp is a successful example of a state program that benefits everyone by habitat acquisition and restoration, science based wildlife management, and public education, giving their citizens an important choice to purchase a conservation stamp or waterfowl hunting stamp as their conscience dictates. Here’s a thought…we’re going on about the “users” of the refuge’s being conservationists, birders, photographers, and yes…hunters, but what about the athletes that use these places for free access to paved roads and nothing else…All too often I have been out watching and photographing birds on the water and some runner comes along clomp Clomp CLOMP!! on the boardwalk scaring everything away…they weren’t there to appreciate wildlife nor did they care about anyone else that may be there…earbuds in and loud, the road was and boardwalk was theirs and only theirs…same with bikers on grass trails. I think refuges should charge an access fee just like state parks. Unfortunately Deb there are people out there that have no consideration for others. I don’t know how prevalent these situations are on National Wildlife Refuges but I agree with you that there should be access fees for all National Wildlife Refuges. With the decrease in duck hunting (and therefore Duck Stamp sales) as well as the congressional budget cuts, access fees could fill in some of the shortfall for the refuges. Check out our “In the News” page for more information on that. Obviously, adding an alternative Wildlife Conservation Stamp for purchase, thereby inviting an extremely passionate support group into the fold, would solve much of the fiscal burden for the refuge system.